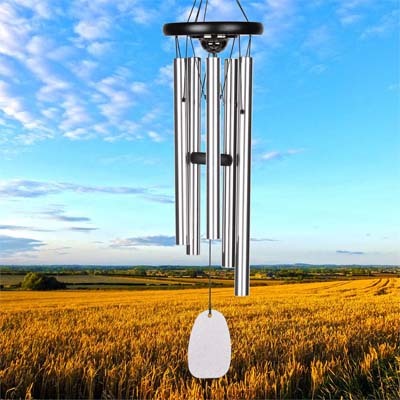 Woodstock Reflections series includes chimes designed for those who want to remember the dearly departed, inspire others or themselves, or spend time in meditation or quiet contemplation. This unique chime has a waterproof compartment where you can preserve a keepsake or memento. Including engraved wind sail with up to 100 characters with your thoughts, feelings, names, and dates. Our Reflections series includes chimes designed for those who want to remember the dearly departed, inspire others or themselves, or spend time in meditation or quiet contemplation. Place a small memento in the compartment located under the wooden chime top. Commemorate your love, preserve a memento or keep a loved one close. It could be ashes, a lock of hair or tuft of fur,a copy of a poem or sand from a favorite beach. It could be a token or charm that represents a favorite hobby, sports team or career choice. The "time capsule" has a weatherproof seal, keeping your treasure safe and secure. The rectangular wooden windcatcher hanging at the bottom of the chime is large enough for you to add an engraving if extra personalization is desired.